Children don’t come with a training manual; parents are expected to figure things out as they go along, and with a world of information at your fingertips, “Google it” has become the catch-cry for many. But finding the right information it isn’t as straightforward as it seems. For parents whose child has disability, the challenge is even greater and Google doesn’t always solve the problem. That’s where Score! comes in. Developed by Victorian peak body Disability Sport & Recreation, in partnership with the nib foundation, this free, interactive online directory helps parents find sports and activities that meet their child’s interests and abilities. Manager Community and Member Services, Tim Nield, said the organisation’s goal was to help as many people with disability find a sport or recreational activity they could play for life. “We know it’s absolutely vital that people with disability do some form of physical activity. There are mountains of research showing that exercise improves your health, reduces the long-term risk of chronic illness like diabetes and cardiac disease, and has a positive effect on a person’s mental health as well. “We want to help people develop the habit of exercise from a young age, so that every Victorian can enjoy the health benefits being active brings. “Score! is just one tool we have developed so parents have the knowledge they need to give their child those opportunities,” Tim said. 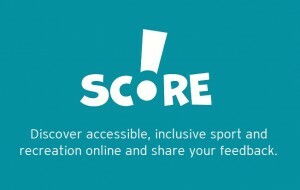 Anyone wanting to use Score! needs to register; the information you provide allows you to filter your search. Once you are registered and have logged in, you can look for events in your local area, venues that are accessible, or programs that suit your abilities. Everything on Score! can be rated, so once you have found an activity you would like to try, you can read what others have said about it. Score! is a fully moderated site, so it is a bully-free zone; insults, epithets and derogatory language are not allowed. Each activity, venue or event listing has contact details or websites listed so you can find out more information before you head off, and the map function can help you visualise where everything is in relation to your home.